You guys know I’ll call out a gun company if they put out crap… And you guys know I’ll give kudos to those that pull it together. I’ve talked about Para, and Ruger, and others… This one though… This surprises me. Kimber. Kimber is a company that basically took Colt and bent them over a knee and gave them a good old fashioned whipping about how 1911’s are supposed to be made. It changed the gun industry as far as 1911’s go. It used to be that you bought a new Colt 1911 and you immediately set about working on it or having it worked on by a Gunsmith. And it wasn’t just Colt, that was everyone pretty much. That’s just the way things were. Until Kimber. Kimber set about making 1911’s that ran right out of the box. Until a few years ago when Kimber’s Quality Control dropped through the floor. I had brand new guns with what looked like used parts in them. I had barrels that had waves in them. All this, I’ve talked about before. It’s in the Archives at the Old MadOgre.com section. I had to send back a whole shipment of Kimber Tac Custom II’s. I just couldn’t trust Kimber anymore. That was then. This is now. Kimber looks like they are taking things seriously again. If fact, it looks like Kimber is better than ever. And I’m not talking cosmetics. I’m talking internals, machining, everything. It looks like they are making some great stuff again. Not only that, but they once again bent Colt over the knee and gave them a whipping again. See, Colt had the Mustang. A mini 1911 like pistol in .380. Colt gave the middle finger to the American Gun Owner and decided they wouldn’t sell to us unwashed masses. Guns like the Mustang were all discontinued. That was many years ago. Many years later SIG came out with the SIG 238, which was SIG’s version of a Mustang. It sold so well that Colt was like “Hey!” and they started making the Mustang again. Well, Kimber looked at the SIG, and looked at the Mustang. And then threw down the Kimber MICRO. It’s like what Kimber did the the Colt 1911’s. It makes the Colt look pretty dated. 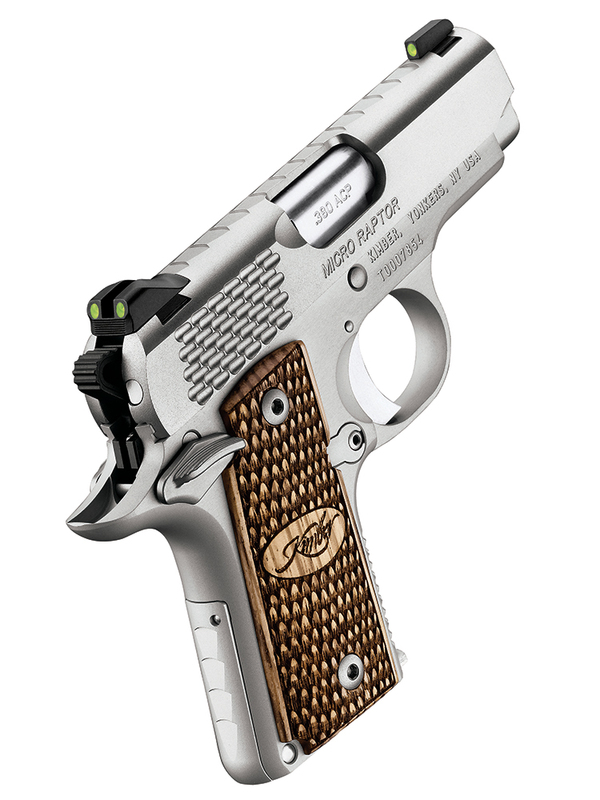 There are various versions of the Kimber Micro. All 13.4 Ounces in weight, all 6+1 Capacity. All look great. But the Micro Raptor… it just looks drop dead gorgeous. And it’s a .380. And I like it. Crazy. Now if Kimber does what SIG did… and make a version in 9mm… I’d be very tempted to buy that. I’m very tempted to buy the Micro in .380 as it is. And I don’t even like Pocket Guns. That’s how cool these Micros are. Don’t get me started about the SOLO. Great looking guns that don’t work right. There’s a sexist political jab I could make there, but I wont. If Kimber could just take the SOLO back to R&D and engineer that thing to run right – That would be great. Other than the SOLO, I think Kimber is back to making real guns again.